Well I wake up at 5 am everyday to go run and inbetween my lecture breaks I find time to go to the gym however when school is too demanding I give up gym but I always make sure never to miss my 5am runs. I started running in 2014. 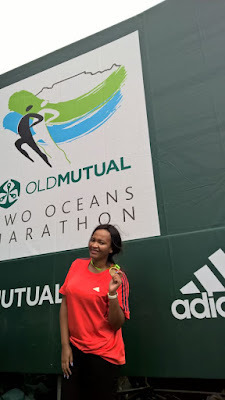 I didn't like my body & I hated the way clothes would fit in my body because I didn't have a waistline but 2 months into running it was no longer about weightloss I had fallen inlove with running. I always think of the feeling of achievement I get when I am done running. The endorphins, the feeling of happiness i get from running and how I must not allow laziness to get the better of me because if I give in I will never get up and I go. My speed I always feel sexiest when I run. Lack? Well everyone around me seems to be active, if its not gym, its running or some other sports so Im mostly surrounded by people who workout. I see school kids carrying their sports bag everyday at the beach in PE everyone is running. I think my city is too active, to me I have not noticed any lack of exercise. My worst are always when I suffer from shin splints while on the road. I ignore the pain but when its too much I stop and do shin splint exercises and pace down and I continue running. You must start small. 2km a daily until you can run that 2km without stopping to catch your breath or needing water and you continue being strong in that 2km. When you can run 2km without stopping move to 3km. Distance covered is not really importance what is importance is smaller runs that help you get stronger, help you with pace training and you will notice when you move to 5km you will have endurance.. I do not like runners who ... doubt themselves..